The Freedom From Religion Foundation is calling timeout on a Georgia school district for its multiple violations of the U.S. Constitution. Not only are coaches and an outside pastor praying with the high school football team, religious propaganda is also being posted on its official social media. Toole is apparently a local pastor who the school employs to pray with and promote religion to the team. The district’s employment of a chaplain is an additional constitutional violation. Public schools cannot appoint or employ a chaplain, seek out a spiritual leader for students, or agree to have a volunteer teach other people’s children that character centers on religious belief, because public schools may not advance or promote religion. The school’s endorsement of Christianity is particularly troubling for those parents and students who are nonreligious or not Christian. 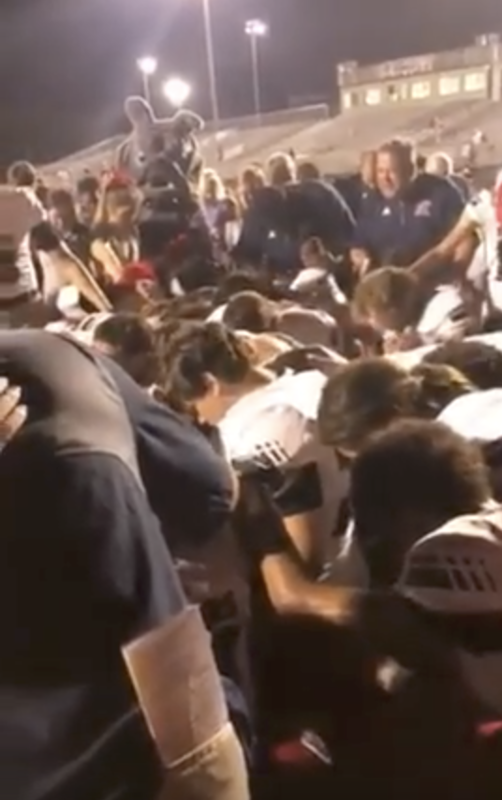 The Toombs County High School football program also regularly posts religious messages and bible verses on its official Twitter account, another unlawful and disturbing practice. It is well settled that public schools may not advance, prefer or promote religion, FFRF reminds the school district. Advancing, preferring and promoting religion is exactly what a school district does when its employees post religious messages on official public social media pages. These proselytizing messages give the appearance of district endorsement of religion over nonreligion, and Christianity over all other faiths. They also conflict with the personal religious and nonreligious views of many district students and families, including the 38 percent of Americans born after 1987 who identify as nonreligious. The Freedom From Religion Foundation is a national nonprofit organization with more than 32,000 members and several chapters across the country, including over 500 members and a chapter in Georgia. Its purposes are to protect the constitutional principle of separation between state and church, and to educate the public on matters relating to nontheism.